and with delight we praise "Nembutsu (Namu Amida Butsu)". by harmonizing with our neighbors. 7th head of the school, Yokan Risshi. 863 AD. The Emperor Seiwa named the temple "Zenrin-ji". Zenrin-ji is the head temple of Jodo-shu Seizan Zenrin-ji sect. The temple has more than 1,100 years of history and is dedicated to Amida. 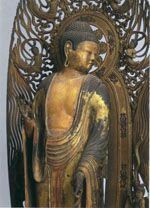 Due to a merciful pose of Mikaeri Amida (Amitabha looking back), the temple attracts many believers and people throughout the world. The temple is also well-known as "Eikando in Maple Leaves", because of its beautiful garden filled with many maple trees. In late November, many people visit the temple to worship the Amida and enjoy the scenery. II: The next age of Eikando, for about 140 years, are regarded as the Yokan to Johen (1166-1224) age. Eikando was a temple of the Esoteric Buddhism of the Shingon sect and also taught the Pure Land teachings of the Sanron sect, which was one of the six sects of Nara Buddhism. Since 1224 or later, Eikando has been a Buddhist temple of the Jodo sect. Johen was a priest of the Shingon sect, but he came to deeply believe in the teachings of the Jodo sect after he read Passages on the Selection of the Nembutsu in the Original Vow written by Honen (1133-1212), the founder of Jodo sect. III: He designated Honen as the 11th nominal priest of Eikando and then passed the post on Shoku (1177-1247), one of the famous disciples of Honen. Shoku gave birth to the Seizan branch of the Jodo sect. After that, the temple was officially converted from the Shingon sect to the Seizan branch of Jodo sect by Joon (1201-1271), a disciple of Shoku. The temple's history dates back to the 9th century. In 853 AD, Shinjo (797-873), a high disciple of Kukai(774-835, and also known as Kobo Daishi), erected a temple on the present grounds of Eikando. In 863 AD, the Emperor Seiwa named this newly-established temple "Zenrin-ji", meaning "Temple in a Calm Grove". In "Zenrin-ji shiki", Shinjo authored various resolutions based on his principles: "Since the teachings of Buddha are practiced by humans, it is my desire that the temple shall be a training place for ideal humans." Since then, Zenrin-ji has trained many virtuous priests and sent them into the world. Among them, Yokan (1033-1111), who is commonly known as "Eikan", is famous for his virtue and aid to the poor. Jodo-shu teaches that humans may be assured of being reborn into Jodo (the Pure Land in the West) by praising repeatedly Nembutsu, "Namu Amida Butsu". Yokan names himself "Nembutsu-shu Yokan", because he believed in the teachings of Amida. Yokan also devoted himself to helping the poor. He built the hospital in Zenrin-ji and planted plum trees to feed plums to the poor as medicine. The plam trees are known as "Hidenbai". There is an interesting story behind Eikando's unique Mikaeri-Amida image and why Mikaeri-Amida is looking back over his left shoulder. In the early morning on Feb. 15, 1082, Yokan was walking around the altar praising "Nembutsu". All of a sudden, the Amida came down the altar and began to lead Yokan. Yokan was stunned and stoped walking, then the Amida looked back over the left shoulder and said "Yokan, you are slow." Yokan awoke and was deeply impressed the merciful pose of the Amida. He pleaded with the Amida to keep the pose forever. Since then, the Amida has been keeping the pose of "Mikaeri (Looking back)". The pose is a symbol of the Amida's mercy to lead people and wait for people who are late in coming to the faith. In 13th century, Shoku (1177-1247), one of the most beloved disciples of Honen (1133-1212), founded the Seizan Zenrin-ji sect and established the important tenets, "Seizan Kyogi". And, thus, for more than 800 years, Zenrin-ji has been a major training site for this Buddhist sect. The temple prospered until the Onin War (1467-1477) which raged in Kyoto for ten years. During this war, Eikando was completely destroyed and remained in ruins until around 1472. Its chief priests devoted themselves to the restoration work for several generations. It was fully reconstructed by the beginning of the 16th century. In early modern times, Eikando fell into ruin again. The policy of the early Meiji (1868-1912) government was to promote Shinto as Japan's state religion and , in turn, to neglect Buddhism. This policy resulted in the destruction of a great number of temples and Buddhist statues throughout Japan. Under such circumstances, Shungoku (?-1881) significantly contributed to social welfare. His good works included constructing the hospital that was the predecessor of Kyoto Prefectural Hospital. Eikando is still divinely guided by the mercy of Amida Buddha as the head temple of the Seizan Zenrin-ji branch of Jodo sect, and is supported by the faith of many adherents to the Pure Land Buddhism. Eikando hosts many works specified as National Treasures of Japan or Important Cultural Assets. Currently, about 58 of these works of art are well known in Japan, and some of them may be found in Eikando in November. Amang them, "Yamagoshi Amida Zu (Descent Amida (Amitabha) over the Mountains) and "Kei (A kind of musical instrument with lotus pattern ) are Nationarl Treasures of Japan. The "Hatou-zu (Waves)" by Hasegawa Tohaku is very impressive painting and attracts many people by its dynamic composition. This is also an Important Cultural Assets. Through the year, there are many events as well as daily services.